Every Illinois household just got a gift from the state government: $4,000 in additional pension debt. That’s not good news for Illinoisans already suffering under one of the worst job recoveries in the nation, one of the country’s highest unemployment rates, collapsing manufacturing, record-high outmigration and the nation’s highest property taxes. Illinois’ pension debt has jumped to $130 billion in 2016, up from $111 billion in 2015, according to the Commission on Government Forecasting and Accountability. State pension funds now have only 38 cents on hand for every dollar they need today to pay out future benefits. Households in Illinois now owe more than $27,000 each in state pension debt, an increase of over $4,000, or 17 percent, from 2015. Illinois’ pension debt has more than tripled since 2002, when Illinoisans owed $7,600 per household. 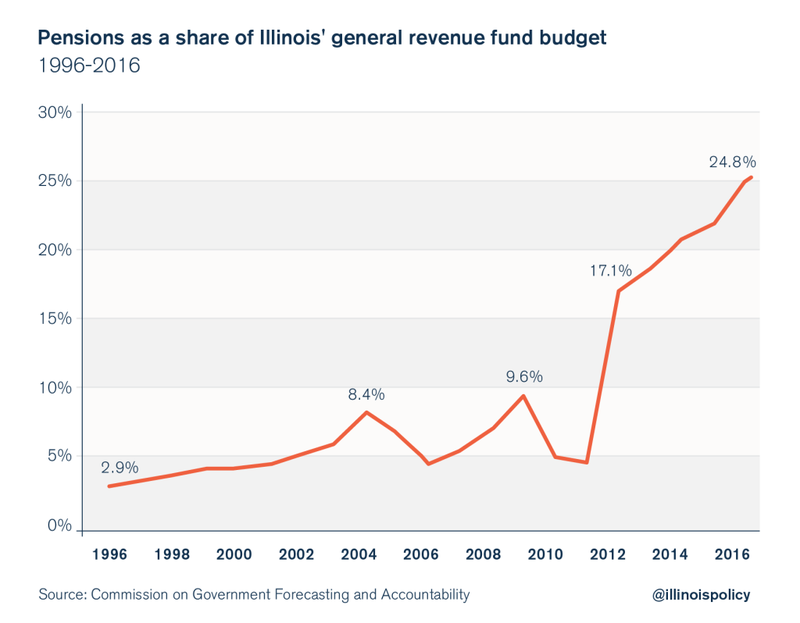 Illinois’ pension crisis has only grown worse over time. Yearly pension costs now consume 25 percent of the state’s general fund budget and are crowding out spending on social services, higher education and nearly every other core government service. 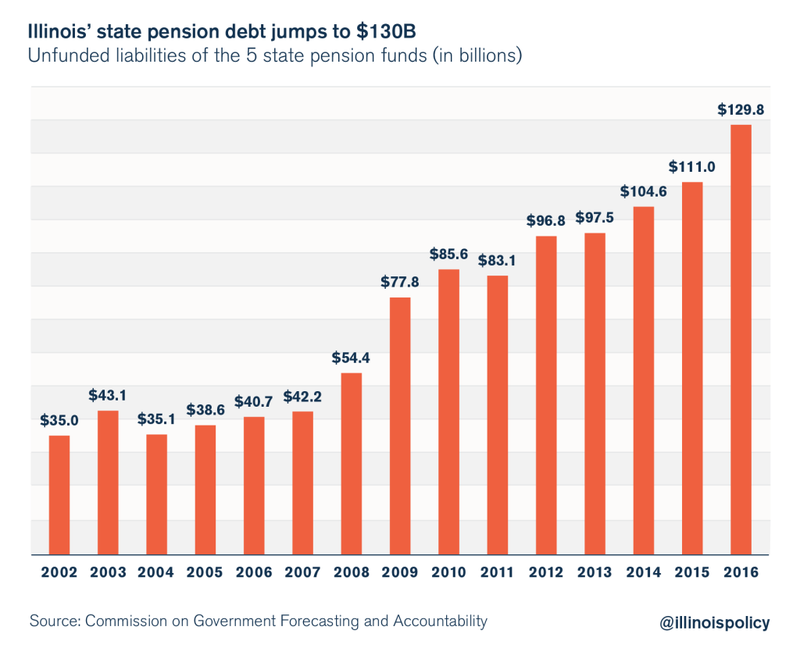 That crowd-out is only going to get worse now that Illinois’ pension debt has increased further. Without reforms, taxpayers will be on the hook for over $1 billion in extra contributions to the pension systems next year. That will only lead to even greater, dramatic cuts in core state services. 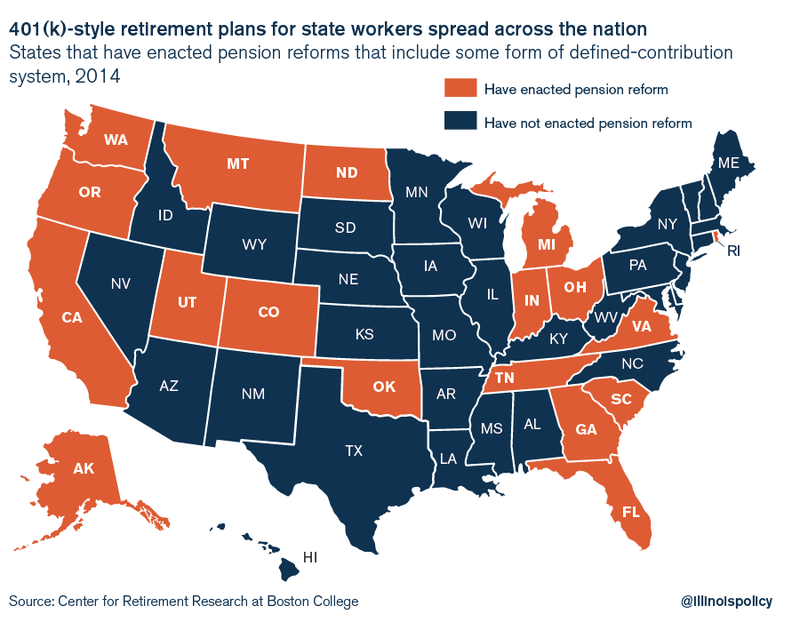 The massive increase in state pension debt is due to the failure of defined-benefit plans. Pension benefits have grown too fast and the funds have vastly overestimated how much they can earn on their investments. In fact, the history of pensions in Illinois has been one of failure. From “compromise” reforms like the Edgar Ramp that only made the pension crisis worse, to politicians promising benefits to workers that taxpayers could never afford, to failed assumptions on items like investment returns and mortality rates, Illinois’ pension math has never worked. It hasn’t worked for taxpayers, who pay more and more every year for pension funds that fall further and further toward bankruptcy. It hasn’t worked for Illinoisans dependent on core government services, who have seen vital services for the developmentally disabled and disadvantaged students diminished or cut entirely to make room for growing pension costs. It hasn’t worked for pensioners, who are stuck relying on pension funds that are teetering close to insolvency to provide for their retirement. And it hasn’t worked for younger workers, who are forced to pay into the pension system and yet may never receive a pension benefit. Illinois should follow the lead of the private sector and many states by ending its unmanageable, and nearly insolvent, defined-benefit retirement plans. Nearly 85 percent of private-sector companies now have defined-contribution plans, and states including Oklahoma and Rhode Island have initiated some form of 401(k)-style reform. Illinois can start by moving new government workers to 401(k)-style plans and giving existing workers the option to have their own self-managed accounts. That, in addition to a constitutional amendment allowing Illinois to reform current workers’ unearned pension benefits going forward, would be a crucial step toward fixing Illinois’ perennial pension crisis.